Borussia Dortmund are now nine points clear at the top of the Bundesliga after a 2-1 win over Werder Bremen on Saturday. First-half goals from Paco Alcacer and Marco Reus secured the victory at Signal Iduna Park, despite a stunning strike from Max Kruse. The result stretches Dortmund's lead over Borussia Monchengladbach, who drew 0-0 at Hoffenheim, with champions Bayern Munich also nine points adrift after their 4-0 thrashing of Hannover. It also means Lucien Favre's side are guaranteed to head into the mid-season break as league leaders for the first time since 2010-11. 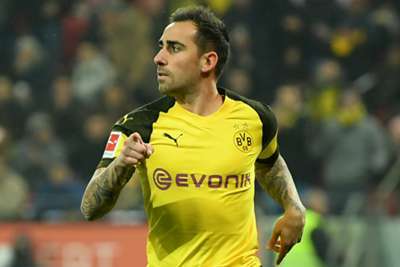 Alcacer headed home Raphael Guerreiro's cross 19 minutes in, taking him to 11 goals in the league for Dortmund in 10 games, one more than he managed in 37 LaLiga appearances for Barcelona. Jadon Sancho teed up Reus to sweep home a second before the half-hour mark, but Kruse halved the deficit prior to half-time with a thumping half-volley from 20 yards out. Werder applied some late pressure in the second half but Dortmund held firm to make it 15 league games unbeaten this season, despite Mario Gotze's late finish being ruled out for offside by VAR.